We have to admit that Bergen is our one of our favorite towns in Norway... because there is so much history there, and because the old center seems so small and manageable. ...We have good travel buddies who have a summer hutte (a summer house) on nearby Varaldsøy Island in the middle of the Hardangerfjord. It's a two hour drive. Still Bergen is the closest airport to fly into. And what a great city. It's a city with a long history. It was Norway's capital in the 12th and 13th centuries, and later it was a trading hub for the Hanseatic League. During that time it was probably the largest of all the towns in the Nordic countries because of shipping... later it was one of the four most important trading stations of the Hanseatic merchants. If you stick to the old center, you'll find it a completely charming city. The area in and around the harbor is attractive and easy to walk. You can often see the Statsraad Lehmkuhl in port. 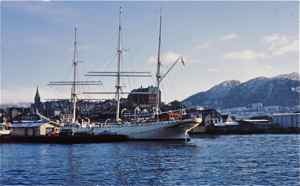 She is Norway’s largest and oldest square rigged sailing ship. Down one side of the waterfront you'll find the Hanseatic Quarter which is called Bryggen. It's the heart of the old town, and this is where you find the colorful buildings you always see in the tourist brochures. Roaming around in this part of town, you'll really feel the history. Check out the Hanseatic Museum which is housed in a medieval merchant's home with type furnishings representative of the era. The wooden buildings in this quarter have burned down several times through the centuries, but they have always been rebuilt in the "old style". The area is touristy and full of pricey little restaurants and boutiques, but it's a fun place to stroll and cries out for you to use your camera. The Fish Market, Torget i Bergen, is situated in the very heart of the city at the end of the harbor, but you won't only find fish here. It's full of vegetables, flowers and .... yikes.... even souvenirs. It's colorful and camera friendly. For an affordable lunch buy some freshly boiled shrimp and eat on the waterfront. For one of the best views of the city, take a ride up Mount Floyen in the Funicular... The Fløibanen. You'll only be 320 meters (1050 feet) above sea level, but you can see a panoramic view of the city and the surrounding mountains and islands. The station is 150 meters from the Fish Market. The Funicular departs every 30 minutes on the hour and half hour. Picnic up here or take in the sunset. This city is a good starting point for the Norway in a Nutshell fjord tours... especially if you want to try and make it a day tour. There are also coastal ships that depart from here and steam north along Norway's scenic coast. Bergen is known as the Gateway to the Fjords. Bring a raincoat or an umbrella. There's more than twice as much rain here as in Oslo. Sunny days are precious and enjoyed by all. Our friends on Varaldsøy tell us they'll have to spend the winter in Florida to work on a tan. There are far too few days like this. Like all of Norway, things tend to be expensive, but with so many areas to walk and so many free views, you shouldn't feel the pinch too much. With all of this to see and do, you really should add Bergen to your travel wish list.